Dr. Nazzario was born in Philadelphia, PA but spent most of his life in Texas. He graduated from Klein High School in Spring, Texas and decided to attend Baylor. His interest in computer simulations in graduate school led to employment in Information Technology Services at Baylor. Dr. Nazzario started lecturing at Baylor in the fall of 2009 and he continues to work in Information Technology Services at Baylor. 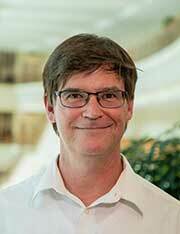 He has been heavily involved in CASPER (Center for Astrophysics, Space Physics, and Engineering Research) at Baylor and his research interests include orbital motions of dust particle orbits. Dr. Nazzario's primary research interest is astrophysics and space physics.. Interested in taking PHY 1420 with Dr. Nazzario? Course Information.